Noted burper and wincer and alleged murderer Robert Durst has been fictionalized several times over the years, as Ryan Gosling’s “David Marks” in director Andrew Jarecki’s 2010 film All Good Things, as “Kenneth Strick” in a 2002 Law & Order: Criminal Intent episode, and as “Eli Madison” in a 2004 episode of the original Law & Order. 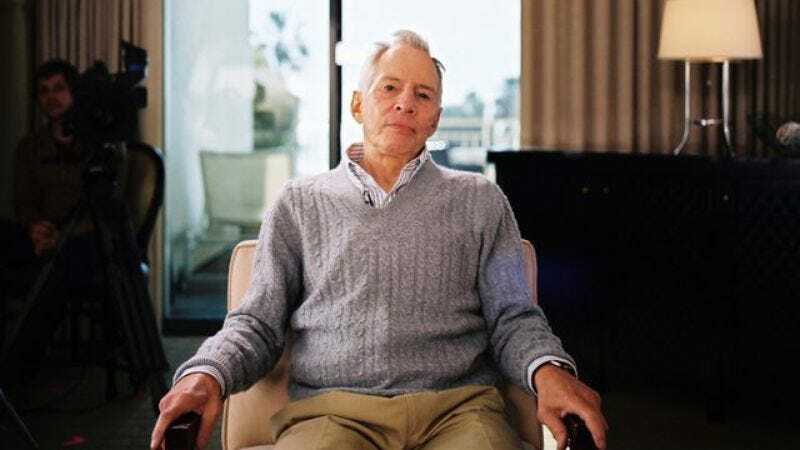 Given the high profile of Jarecki’s HBO documentary series The Jinx earlier this year, subsequent murder charges for Durst, and the lurid details that both brought to light, however, it was perhaps inevitable that the sole surviving member of the Law & Order franchise would mine the Manhattan real estate scion’s life story for an episode of its own. September 23 will bring the two-hour premiere of Law & Order: Special Victims Unit‘s 17th season, and with it, another thinly-veiled Durst. The Law & Order universe’s other two ersatz Dursts—Bobert Bursts, let’s call them—mainly hinged on the real story’s cross-dressing elements (the slightly built Durst posed as a mute woman in 2000 and 2001 while avoiding police questioning over the 1982 disappearance of his wife Kathie and 2000 murder of his friend Susan Berman). This one, on the other hand, appears to draw primarily from The Jinx itself, with an SVU-ified, “Kill ‘em all, whatever it takes,” standing in for, “What the hell did I do? Killed them all, of course,” the damning note-to-self Durst muttered in the final episode without realizing his microphone was still on. Played by Law & Order veteran Dallas Roberts, this version of Durst seems to be a returning character named Greg Yates, who showed up last season as a smug, wealthy doctor and serial killer tripped up in court by his own hubris.